Last year, the GOP Secretary of State of Florida Ken Detzner tried to purge 180,000 Americans, mostly Hispanic Democrats, from the voter rolls. He was attempting to break Katherine Harris' record. Detzner claimed that all these Brown folk were illegal "aliens." But Section 4 of the Voting Rights Act requires that 16 states with a bad history of blocking Black and Brown voters must "pre-clear" with the US Justice Department any messing around with voter rolls or voting rules. And so Section 4 stopped Detzner from the racist Brown-out. We can go from state to state in Dixie and see variations of the Florida purge game. It quickly adds up to millions of voters at risk. Whom do they think they're fooling? The Court itself, just last week, ruled that Arizona's law requiring the showing of citizenship papers was an unconstitutional attack on Hispanic voters. Well, Arizona's a Section 4 state. Palast says it's a political move by the court to prevent another Obama: "The Republican court knows that to swipe 2016, they had to replace the Voting Rights Act with a revival of the Katherine Harris act." Gawker has this interactive thingy where commenters can tag parts of images. 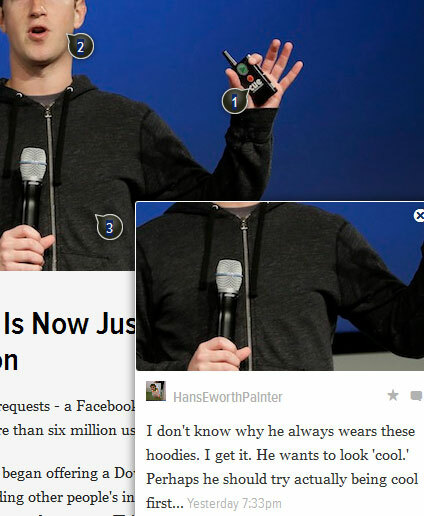 Above is a comment noting the disconnect between Mark Zuckerberg's "cool" hoodie and uncool self. This year, Zuckerberg formed a politically active nonprofit, FWD.us, that sought to influence the immigration debate to make it easier for Silicon Valley corporations to import tech workers. There has been no ideology involved, only expediency, in how FWD.us pursued its ends. It decided to put its massive financial clout to work giving politicians whatever they wanted in hopes that this would lead to an advantageous quid pro quo arrangement. Toward that end, the group began running ads in favor of the Keystone XL pipeline (that will bring particularly carbon-dirty tar sands from Canada to the U.S. Gulf Coast) to support a Republican senator and other ads in favor of drilling in Alaska’s pristine Arctic National Wildlife Refuge to support an Alaskan Democrat. 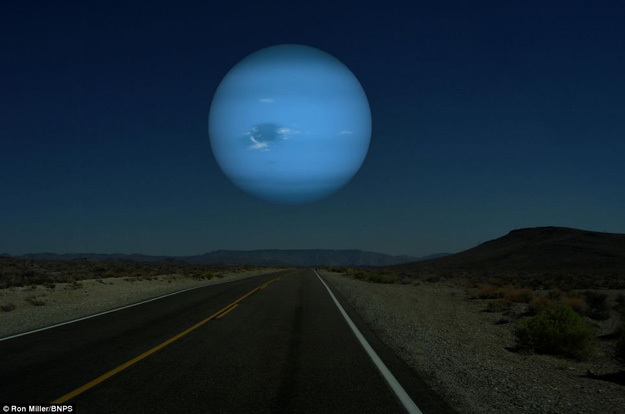 Neptune out your car window. 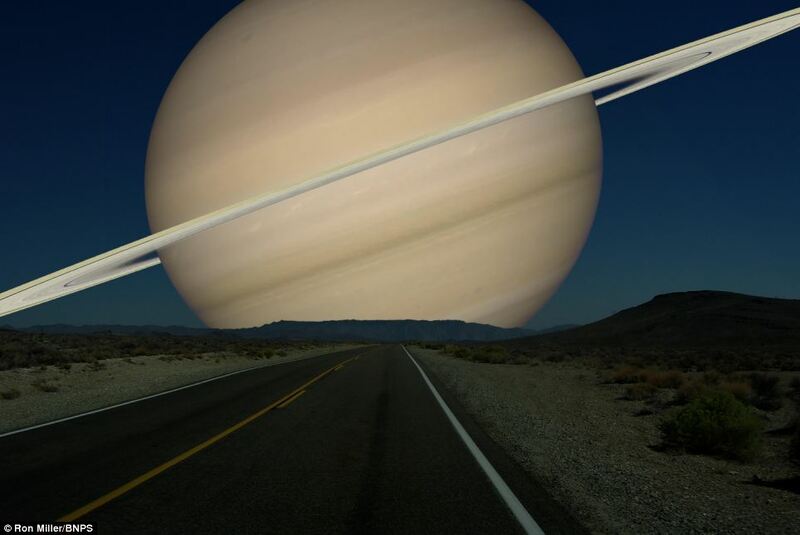 From a series of digi-visualizations of what other planets would look like from Earth if they were same distance away as the Moon. Let's forget that if you saw this image you'd probably be dead as Earth was assaulted by unimaginable tidal forces. Update: Jon Williams: "Fact-checking Tom Moody on the Neptune Roche limit. (It's true! The earth would be torn apart!)" Hey, I know my science fiction. 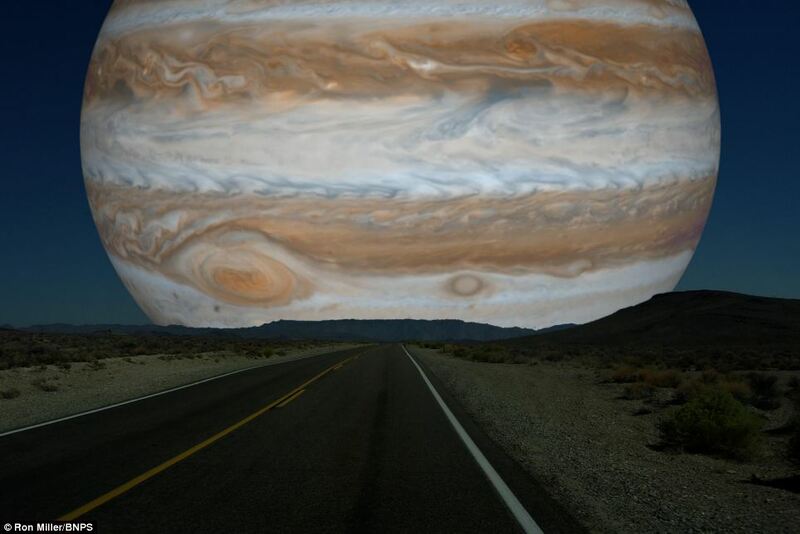 The Jupiter and Saturn pics are even more preposterous. And the photo-collager is a "former NASA art director" -- not to say that people associated with the space agency can't indulge in wild, impossible flights of whimsy. Feedspot -- A correspondent described this as "the least bad right now." Feedly -- Particularly wired to import Google Reader data - do it soon. You still have to login through Google - still waiting to see how they handle logins after 7/1/13. Update, 9/22/14: Feedly is still forcing you to sign-in with Google. See Yves Smith on the yuck factor of "social logins." Update, 1/21/2016: Feedly finally added email logins so you don't have to use Google anymore to access the product. Bloglines -- I've used this for years. They seem to have switched recently to requiring a login every time you view (i.e., the "remember me" button is worthless). Update, 9/22/14: Bloglines is still going, under the umbrella of something called "netvibes." You stay logged in, but the site has a penchant to go offline for 1-3 days with no warning or explanation. Update, 1/8/15: Bloglines users had their feeds moved to the Netvibes platform sometime last year, without any explanation of the switch. My Bloglines login continued to work on Netvibes but last week the Bloglines "dashboard item" stopped working. I am continuing to use Netvibes as an alternative to Feedly, but I had to manually re-add the feed URLs. Netvibes is a subsidiary of a French company, Dassault Systèmes. The Old Reader -- Modeled on Google Reader before it was merged into the Google Plus empire of hell. Livedoor -- From Japan -- I get incoming links from this. Bonus: Hundreds of tools unironically wishing Google Reader a happy retirement. All of these comments should say, "thanks for nothing, too bad your attempt at web hegemony failed in favor of another attempt at web hegemony, yours truly, victim"
Update: Go Read explained in a blog post (hat tip Pretzel). "Open source" but Google login required. Update 2: Naked Capitalism recommends Digg's new feed reader, particularly as an alternative to Feedly and its design in "hipster Brooklyn green." Update, 9/22/14: See Naked Capitalism's Yves Smith on the yuck factor of "social logins," including Digg's. Update 3: AOL Reader (still in beta) - you have to sign in using AOL's or one of the other big evil spy companies' logins, natch.